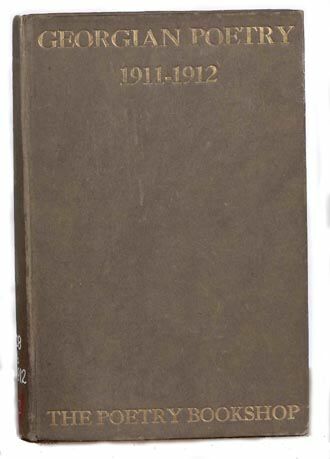 This series of five volumes: 1911-1912, 1913-1915, 1916-1917, 1918-1919, and 1920-1922, was the forum for the works of the Georgian poets before, during and after the war. Such war poets as Rupert Brooke, Siegfried Sassoon, Robert Graves, Edmund Blunden, and Isaac Rosenberg all published in Georgian Poetry -- indeed, many getting their start as poets in the pages of the series. Even early works by D. H. Lawrence (who is not generally associated with the Georgians, but was part of the Georgian school) appear in the series. And the poetry of Wilfred Owen (who was proud to be considered a Georgian) would certainly have been published in Georgian Poetry had Edward Marsh, the editor, not prohibited the works of deceased authors. At any rate, by the end of the war (if not before), Georgianism was a spent force, and Owen's work was instead published posthumously by Edith Sitwell in Wheels 1919, effectively disassociating him with the Georgians in the minds of most later critics. Before the war Rupert Brooke collaborated with (then better known Great War poet) Wilfrid Wilson Gibson, Lascelles Abercrombie, and John Drinkwater on a publication entitled New Numbers. Rupert Brooke's famous "1914" sonnets, including "I. Peace" and "V. The Soldier," first appeared in volume1, number 4 -- which turned out to be the last issue of New Numbers, as the war, and especially Brooke's death put an end to the collaboration. Foreshadowing the innocent Ringo-for- Pete Best exchange, Brooke named Wilfrid Wilson Gibson, Lascelles Abercrombie, and Walter de la Mare (rather than Drinkwater) as his heirs, unintentionally dooming the three to a lifetime of financial independence. 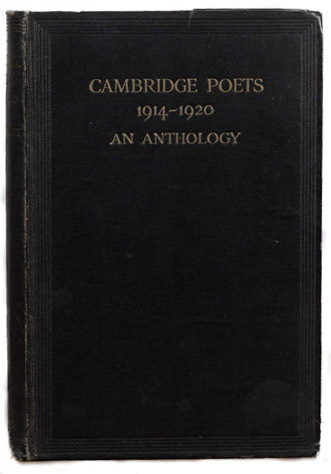 A post-war anthology containing works by poets who had been at one of the Cambridge colleges between 1914-1920. Includes Rupert Brooke and Jeffrey Day (both of whom died in the war), as well as Siegfried Sassoon (who went back to school after the war). BLAST: Review of the Great English Vortex, edited by artist and writer Wyndham Lewis (who would later fight at Passchendaele, and publish his memoirs as Blasting & Bombardiering), occupied the spot on the opposite end of the spectrum from New Numbers and Georgian Poetry. Vorticist Ezra Pound defined "Vorticism" as "the point of maximum energy, [the vortex] represents, in mechanics, the greatest efficiency" (vol. 1, p. 153). Over BLAST's "Manifesto" published in volume one, on June 20th, 1914 (eight days before the assassination of Austria-Hungary's Archduke), hovers a nostrdamic air of naive prophesy. One of the signatories of the BLAST "Manifesto" was Great War poet/ author Richard Aldington. Ezra Pound published poetry in BLAST, as did T.S. Eliot. Ford Madox Hueffer (later Ford Madox Ford), who served in the Great War as a 41-year old subalturn, fighting on the Somme and being gassed, published the first part of his novel The Good Soldier in BLAST under the title "The Saddest Story" (Ford Madox Ford also wrote what is considered the greatest work of fiction about the Great War: Parade's End). With its lists of things to "Blast" ("years 1837 to 1900" (vol. 1, p.18)) or "Bless" ("the Hairdresser. He attacks Mother Nature for a small fee" (vol. 1, p. 25)), and its discussions of Feng Shui and Picasso's work, BLAST is a reminder that Modernism was on its way even before the Great War.